. :: Len's Ace - Racing ::. 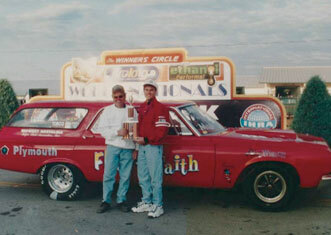 Len’s passion has always been cars and racing. When he wasn’t hard at work in the hardware store, he was working even harder on his racing. 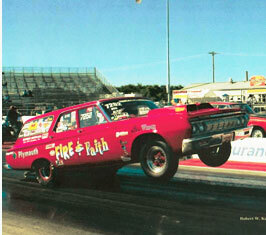 He’s been racing since the 1960’s, when drag racing was in its infancy. Fast forward 50 plus years to 2012, add a second generation, and three amazing cars and you have Len’s racing team. 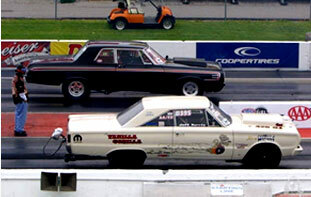 It currently consists of a 1963 factory aluminum Max Wedge Plymouth Savoy driven by Paul Habura, a 1964 Max Wedge Plymouth Savoy Wagon driven by Len Grimsley III, and a 1967 Plymouth Hemi Belvedere driven by Jeff Burris. 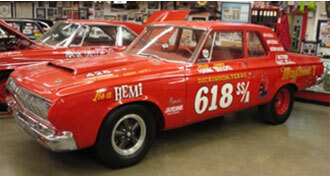 The 1963 Plymouth Savoy has received numerous awards and is arguably the fastest Nostalgia Super Stock car in the world. Len’s race cars are all run in AFX classes of nostalgia Super Stock racing. 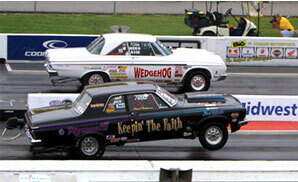 The venues are all over the country and are associated with the NHRA (National Hot Rod Association) and NMCA (National Muscle Car Association). 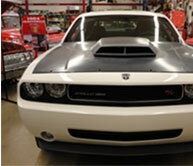 Coming soon in 2012... a 2009 Drag Pak Challenger driven by Len Sr. This car has been raced since 1996. 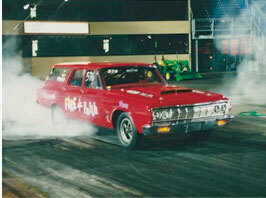 It was built by Len and has raced in Nostalgia Super Stock events all over the country. 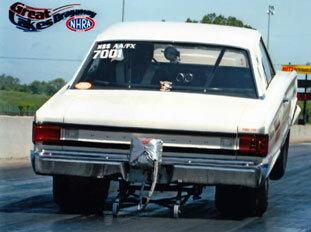 The wagon competes in the AFX classes of the Nostalgia Super Stock with a best time of 9.15ET @ 150MPH. 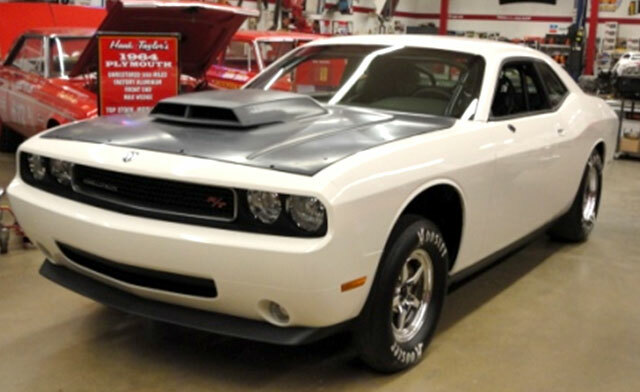 This car is a factory built aluminum Max Wedge that came from Chrysler with aluminum fenders, hood, doors and other misc. 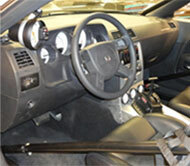 front end parts. 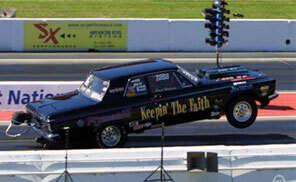 It has been a race car its’ entire life with Len’s team racing it since the mid 1980’s. 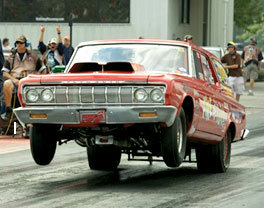 This car is considered one of the fastest if not the fastest Nostalgia Super Stock car in the world. Its fastest pass last year was 8.48ET @ 160MPH. Its’ incredible speed is all motor and carburetors with all original factory body components and 10.5” tires…no nitrous, no turbos. 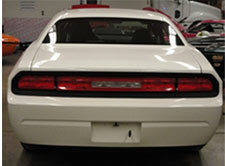 This car has been racing in National Super Stock events since 2001. 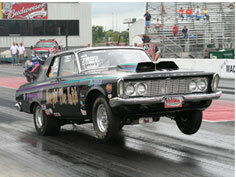 It it considered one of the fastest outlaw Super Stock Hemis in the country with a best time of 8.78ET @ 152MPH. Factory race car #72. Under Construction. Coming soon 2012 to NHRA A/SA. 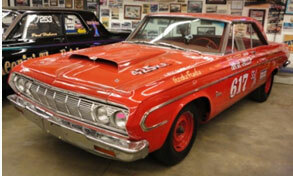 Len’s owns a piece of racing history… a 1964 factory aluminum Max Wedge and a 1964 factory Aluminum Hemi Super Stock. 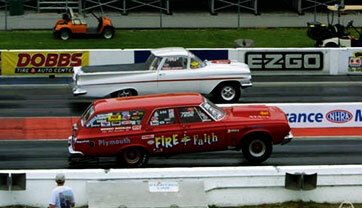 Both cars were previously owned and driven by Hank Taylor back in 1964. 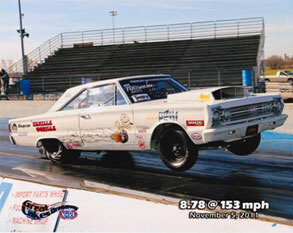 The Hemi car was a NHRA National record holder in 1964.